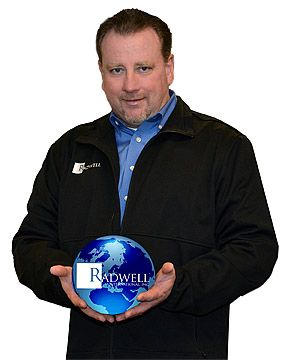 Meet the CEO of Radwell International, Inc.
Brian Radwell, President and CEO explains it like this: "Radwell International, Inc. sells and repairs industrial electrical and electronic control devices. We sell and repair timers, counters, photoelectric sensors, circuit breakers, pushbuttons, PLC's, motors, speed control and any other devices used to make machinery run." Specifically, Mr. Radwell says that Radwell services vehicle manufacturers, chemical plants, food processing facilities, municipalities, government agencies, bakeries, power plants, amusement parks, exporters, plastic moulding and extruders, steel plants and a long list of other business sectors. in the world. 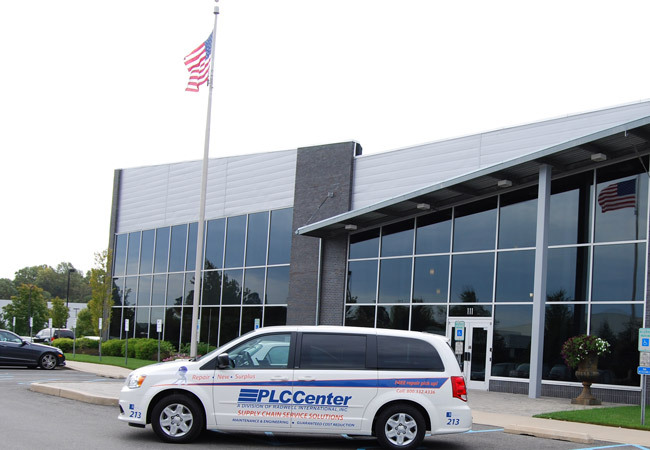 "We buy back new and used controls from plant closings, auctions and inventory overstock. We certify the parts, and then we ship them in custom Radwell packaging and sell them for half of their original price. We sell 30% of our products outside the US," said Radwell. Brian Radwell grew up in the small town of Medford, New Jersey. As a freshman and sophomore, Brian enjoyed playing football for his local high school. In 1982, times got tough and money was tight. Without a sure path to college through an athletic scholarship Brian decided, against his coach's advice, to quit football and started working. "At 15 years old I became the shipper at Speck Industrial Controls. 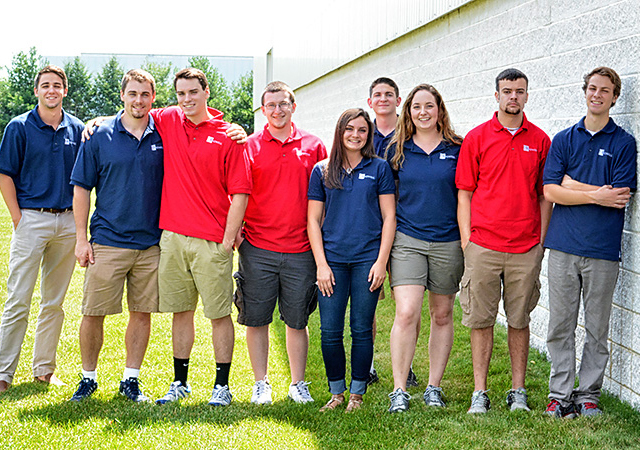 We were a small industrial control distributor employing five people in Mount Laurel, New Jersey. My father Jerry owned a small percentage of Speck and trained me in the ways of industrial manufacturing and the importance of electrical and electronic controls." Brian continued high school and opted for early-out programs to more quickly begin training and working in the expanding automation industry. Speck was struggling. Brian decided to remain the shipper and take a second job as a fuel station attendant in nearby Marlton. "This allowed me to work until midnight almost every night while learning how to earn money." Between the ages of 15 and 18, Brian maintained a full high school schedule while working two jobs. Brian was 18, a graduate high school student and beginning an uncertain journey into the future when a great opportunity presented itself. Jim Speck, Owner and President of Speck, decided to close shop. 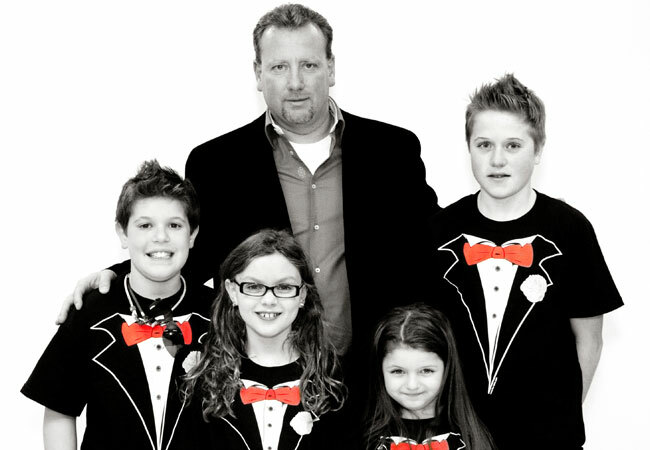 Brian graduated in June of 1986 and joined his father in taking control of Speck. Brian had begun an accelerated career in industrial sales and repair. "I worked around the clock handling repairs at night and new product sales during the day. As a company of just four people, we all had to endure long hours and tremendous stress." 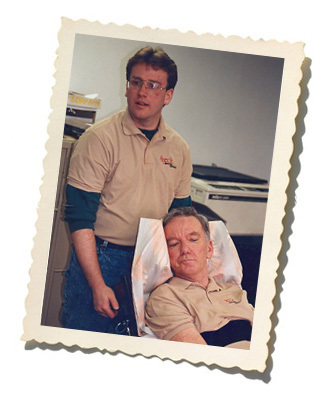 Brian's father, Jerry, did not fare well and suffered a heart attack just a few short months after the takeover. 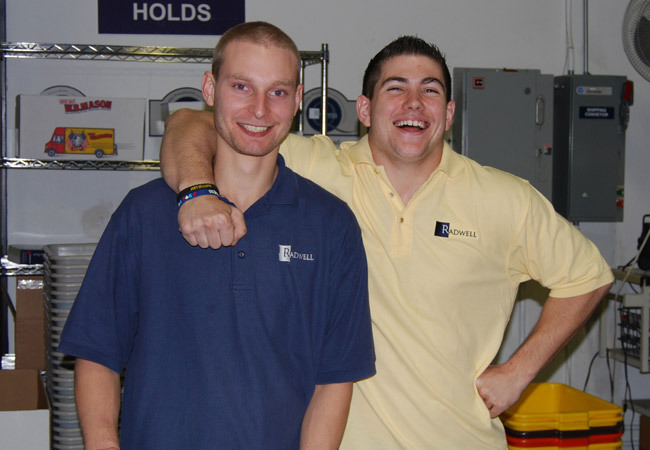 Brian now took on the responsibility of running the company from his father who remained incapacitated. His mother, Darlene, began a long journey filled with many trials. Immediately, Brian recognized that it would take everything in him to build a company that customers could trust. He focused on developing a close relationship with his customers. The company would have to be faster, better and less expensive than any competitor. Brian did not know that the competition would try to stop him at any cost. First, the largest repair competitor sued Brian for printing a repair price book and stated it was against their exclusive copyright. 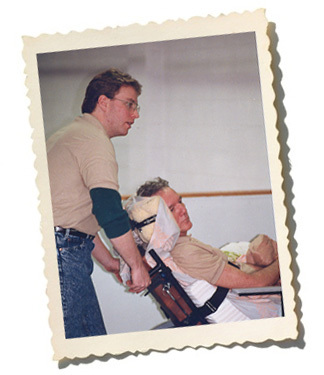 Huge legal fees and the increasing cost of Jerry's medical insurance was more than the company could afford. 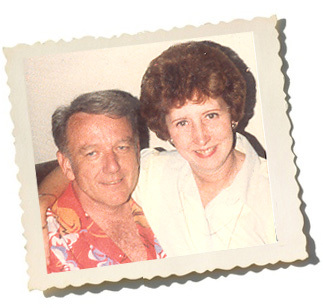 "We lived on $25.00 per week pay and stayed at the office through the nights until the battle was over," Brian recalls. "Next, the largest US manufacturer of industrial controls attacked us claiming that we could not say that we could repair their products," Brian further explains. Again, an expensive legal battle ensued and money was short. All of these problems were too much for Jerry to bear. He suffered a heart attack that required emergency bypass surgery. This further complicated Jerry's support of Brian for a longer period of time. 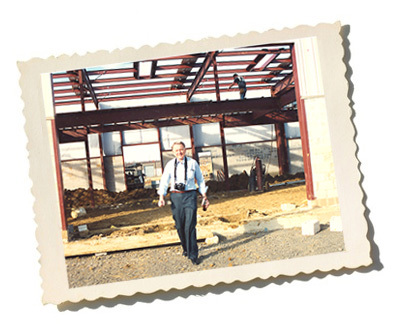 At 22 years old, Brian was prepared to compete with the established larger companies. The lawsuits and attempts to derail Radwell subsided for a while. Brian had earned the reputation of a young determined CEO not afraid of going toe-to-toe with the bigger 'industry giants,' and Brian was willing to do whatever it would take to win. "This made competitor's think twice about bringing false law suits in an attempt to drive us out of business," Radwell adds. Brian was extremely close to Jerry and endured tremendous sadness and depression in seeing his father suffer. Brian was determined to give Jerry the best support he could and the highest quality of life possible. Fortunately, the company had insurance that would allow Jerry 24-hour home nursing care. Without it, Jerry would have had to be placed in a nursing home. 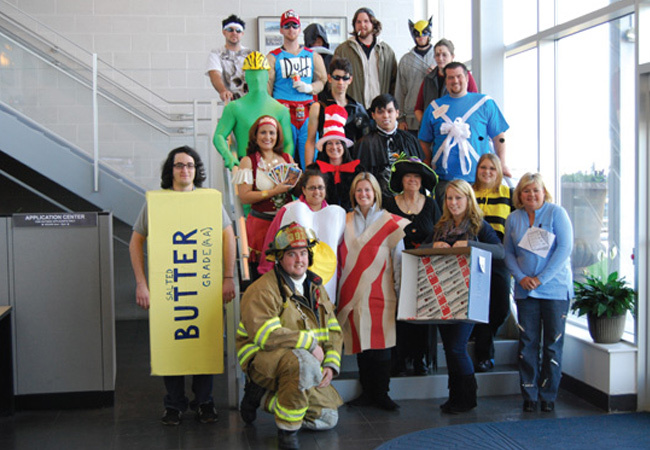 The company pulled together as a team and did not miss a beat. Jerry was in his very early fifties when Brian refused to allow him to be placed in a nursing home. "This is when the largest battle began," Radwell exclaims. 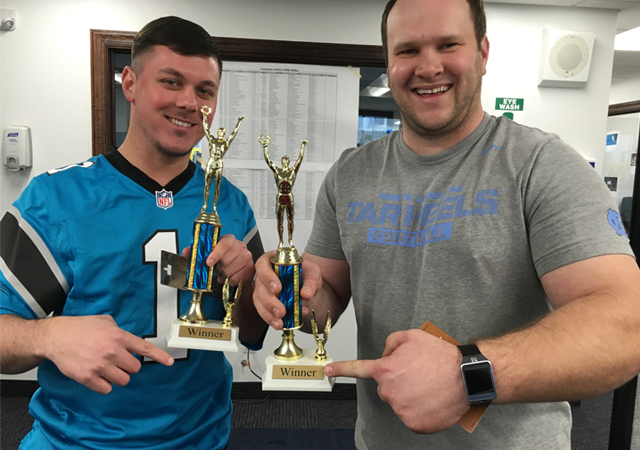 "We employed 15 people and the insurance carrier raised our rates from $2,000 per year for an average employee to $60,000 per employee per year!" This was on top of the fact that his father Jerry still needed the insurance. It was costing Speck nearly $1 million per year. The insurance that was available to replace the current policy did not include home nursing care cover. Next, the insurance company sent a letter stating that the policy Jerry had would be cancelled and that he had to switch to the new policy or find another company. This left no option other than to take action against one of the largest insurance companies in the world, beginning the longest battle in Brian's career. 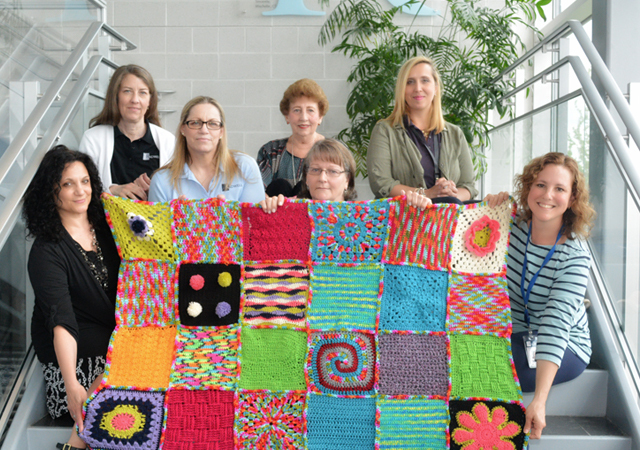 "The whole company was working as a team to help to fight this battle. Years later we won against the insurance company, and my father never spent one day in a nursing home," Radwell states beaming with extreme pride. 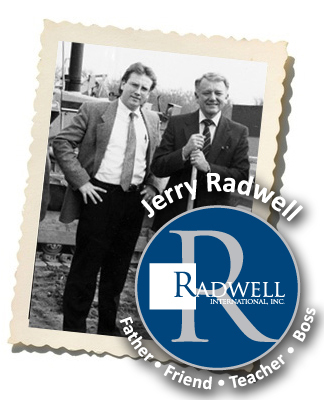 Jerry Radwell died in 2002 on New Year's Eve at home in Medford, New Jersey. 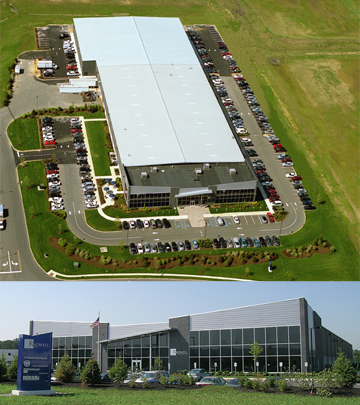 In 2005, Speck Industrial Controls became Radwell International, Inc. and moved into a new 6,500 square metre facility with a 1,400 square metre state-of-the-art repair centre in Lumberton, New Jersey. Radwell's new facility also contains 3,250 square metres of inventory space including the massive two-storey 'Area 51' stock system. In 2008, Radwell's net sales reached $37 million. 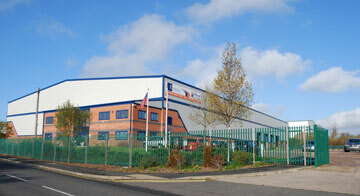 In May of 2009, Radwell added more warehouse space bringing the Lumberton headquarters up to 10,000 square metres. 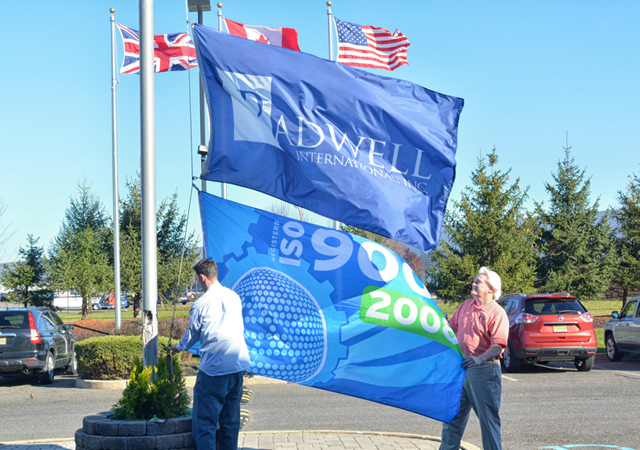 In 2011, Radwell International reached a major milestone. The company has expanded into the European markets by establishing a repair and distribution center in the United Kingdom. The intent was to bring the Radwell.com brand to the overseas marketplace. 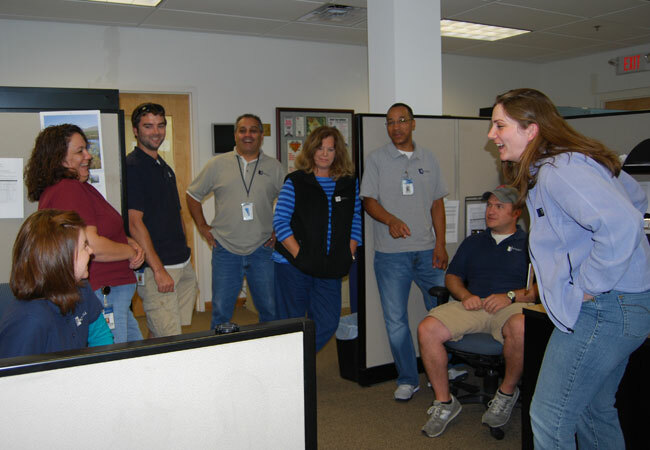 Radwell also continues to add sales and service personnel in the US. 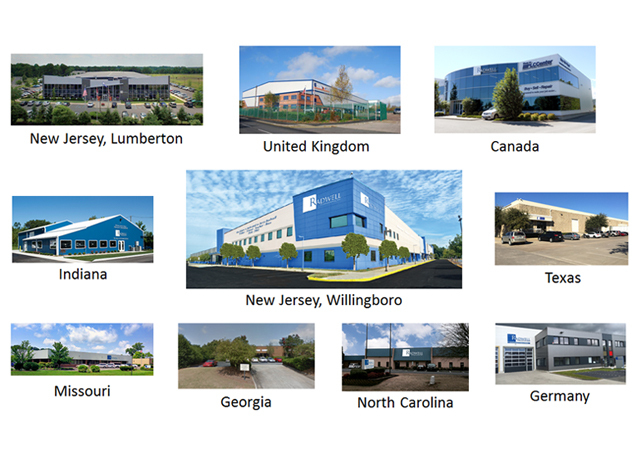 This growth expands Radwell’s national and global presence as one of the largest industrial repair and distribution facilities in the world. 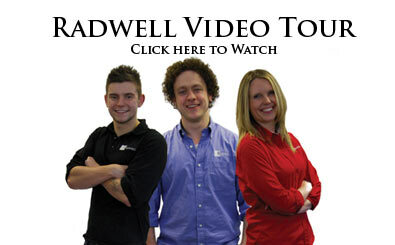 In 2012, Radwell International achieved yet another major milestone. The company expanded into the Canadian market by acquiring Enterprise Automation, a Canadian repair operation, in July 2012. Enterprise was transformed into Radwell International Canada and has been servicing the Canadian market ever since. 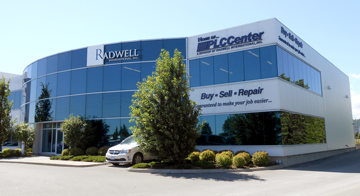 As of January 1 2013, Radwell International Canada is operating out of a brand new repair and distribution facility located in the Greater Toronto Area. This facility was designed with customer service in mind. Radwell International Canada will perform repairs in house and provide our customers with access to the vast inventory network our US and UK customers enjoy. Radwell International is expanding at an incredible rate and our Canadian facility and team is just the latest step in the long and prosperous journey ahead. 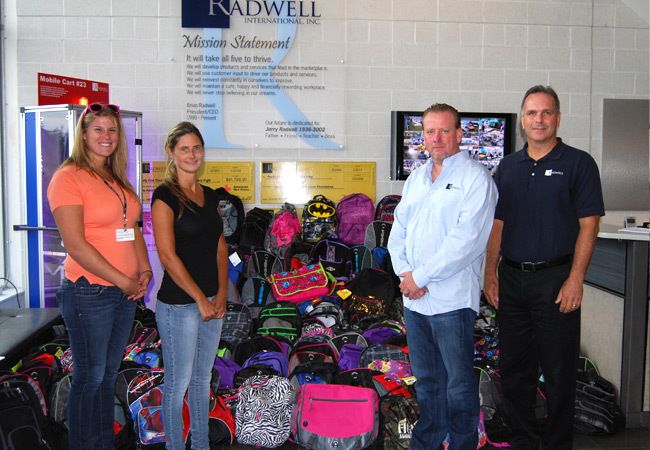 Radwell donates back to the community and the world. Hundreds of support cheques cover the walls. 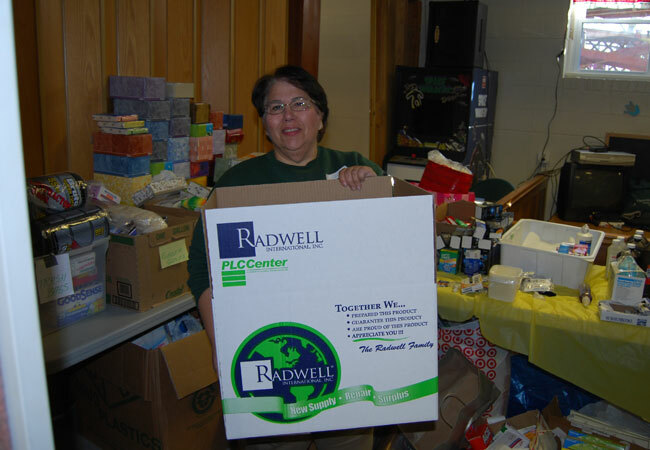 In addition to its commitment to continue to grow its business here and abroad, Radwell sees itself as an important part of the local and global community through its ongoing efforts to "give back." As Brian Radwell explains, "I feel it is the responsibility of every successful business to support the community and to help others." Radwell upholds that responsibility every single day. 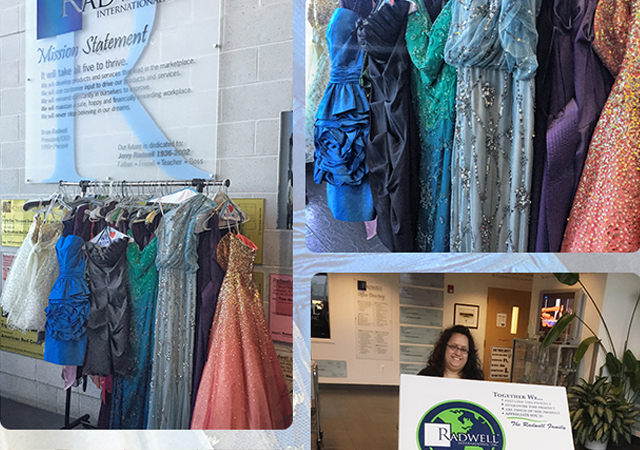 In the past few years alone Radwell has donated to numerous local and national causes and community efforts. 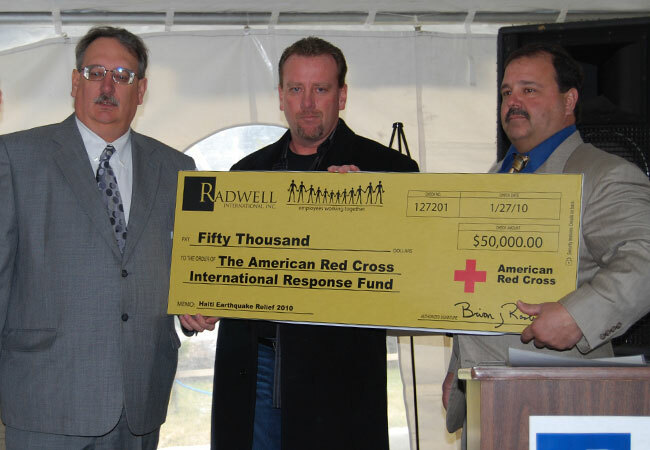 If Radwell can help in any way, it usually does -- from requests to support employee-initiated efforts such as various charitable bike-a-thons, walk-a-thons, and sports team sponsorships, to the many research and educational foundations, to providing financial assistance to the various disaster relief efforts. 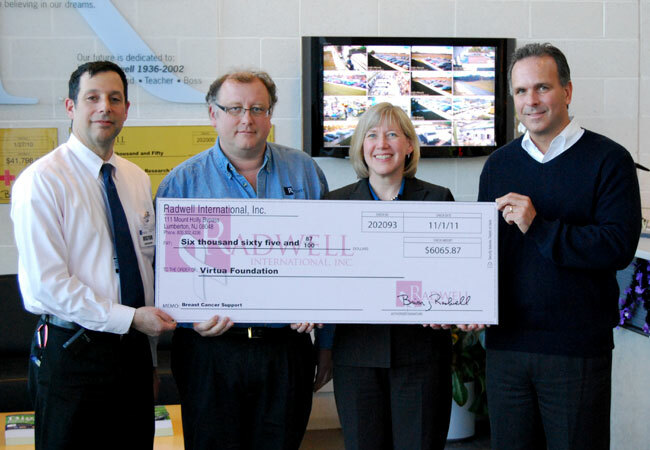 Recently the company donated over $10,000 to the Virtua Foundation for breast cancer research. Radwell maintains an intense commitment to its people as well and understands the role that the collective efforts and talents that its staff plays in its success. 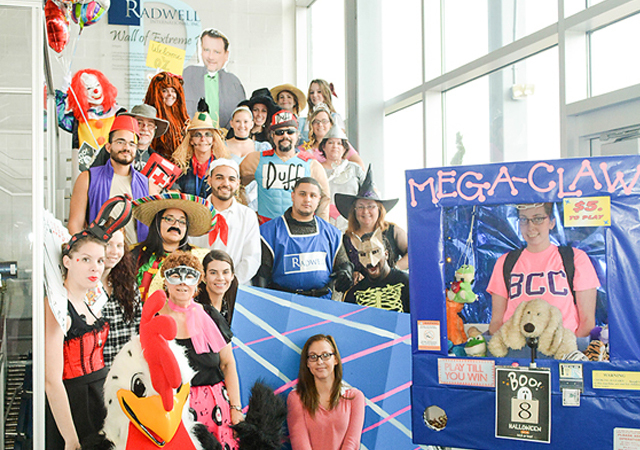 In the recent economic downturn that has plagued the world, Radwell is proud of the fact that not only did it not lay any staff members off due to the slowdown, but it continued to hire and expand. 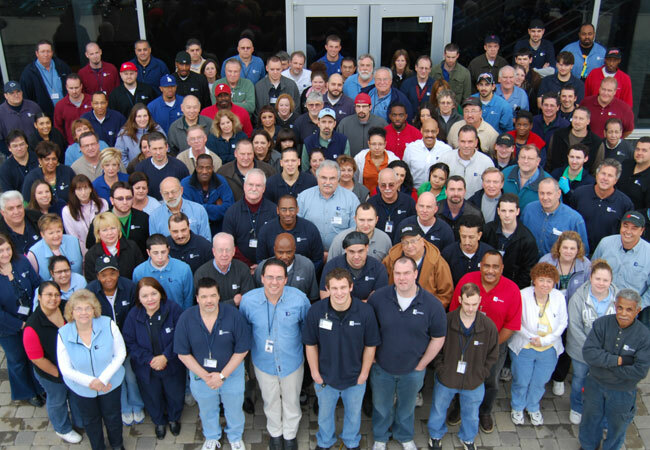 Today, Radwell employs over 900 people and has customers all over the world. 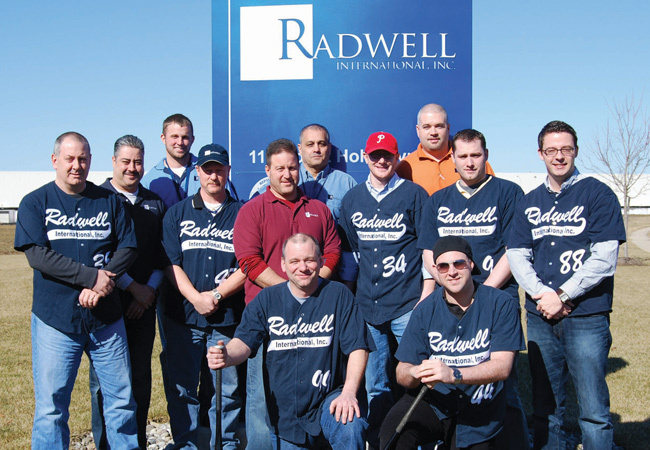 As 2016 unfolds, Radwell's customer base continues to expand. We have acquired and added locations in Indiana, North Carolina, Georgia, Missouri and Texas. Radwell has also opened a new Germany location in May of 2016. We are determined to create the best industrial repair, distribution and surplus automation company in the world. We have added to our global inside and outside sales force and to our Engineers and Technicians. Our continued growth is to serve our customers’ expanding needs. 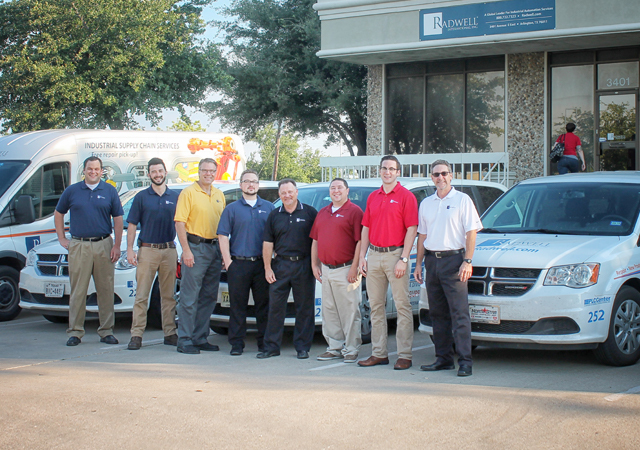 Radwell strives to offer the highest in reliability and truly care about our customers, as we work to provide the best service possible. Remember think savings first, and never sacrifice quality or customer service! 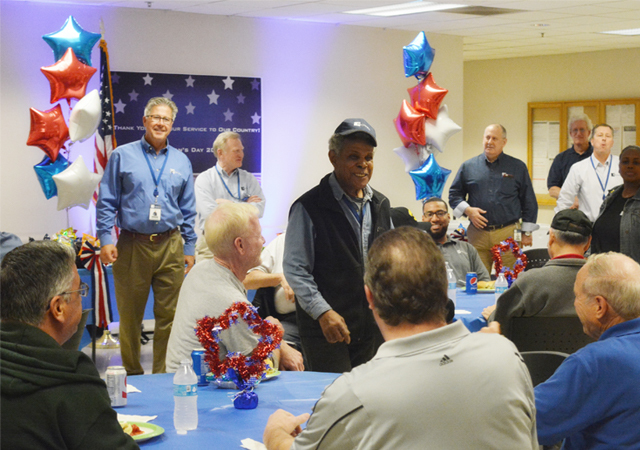 Mark King was announced as the MVP of 2014 at our Holiday Party. Mark has been part of Radwell for over 30 years. 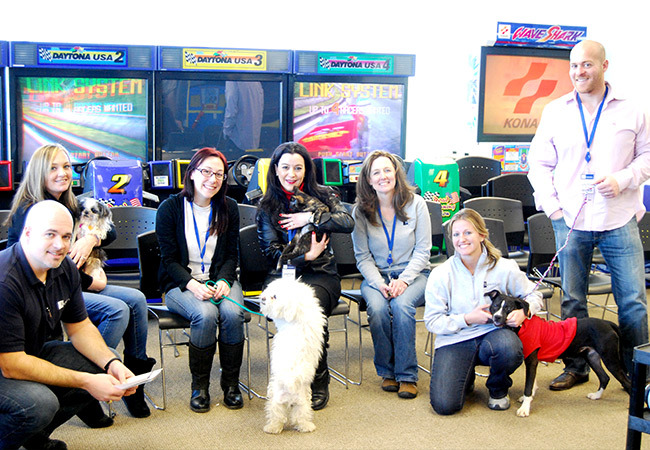 Radwell hosted an event for PAWS, a local animal shelter non-profit organization. We even had some people adopt dogs and cats. 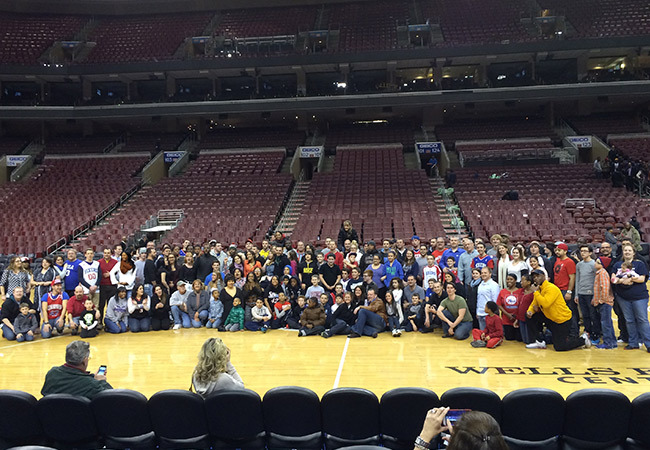 Our US staff spent a night at the Philadelphia Sixers game. It was a blast! 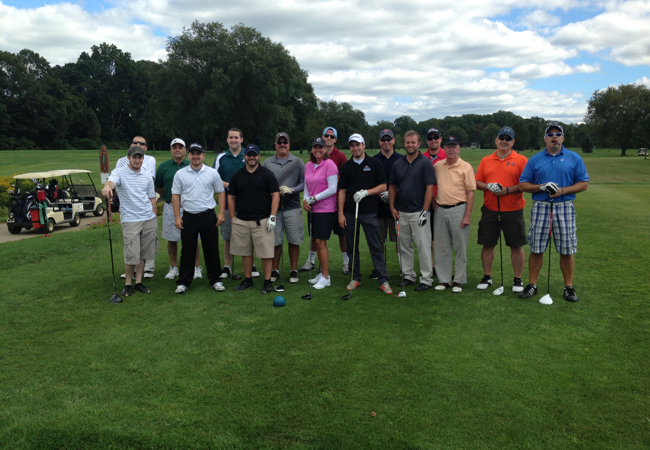 1st Annual Radwell Golf Scramble 2013 at the Golden Pheasant Golf Club. 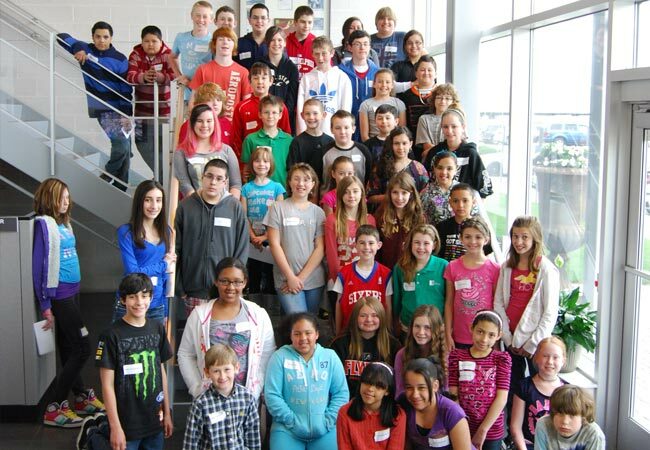 We supplied over 176 backpacks full of school supplies for kids in need for the Drenk Foundation. 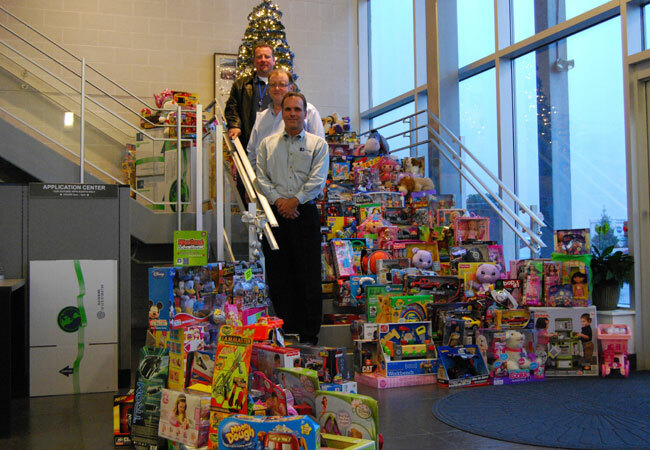 Our 2012 Toy Drive was our biggest yet. 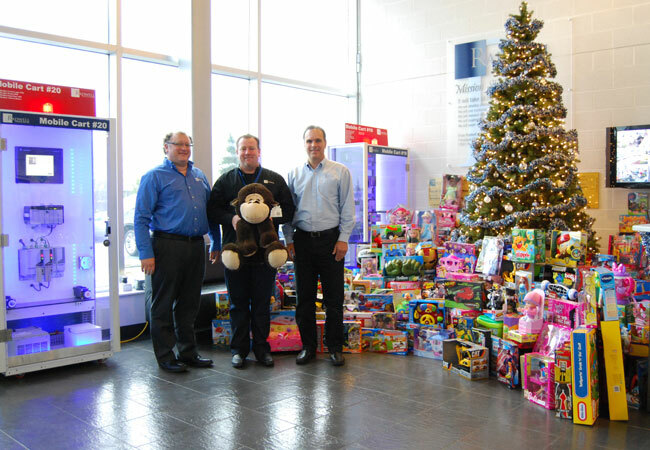 We donated over 500 toys to local charities for the holidays. 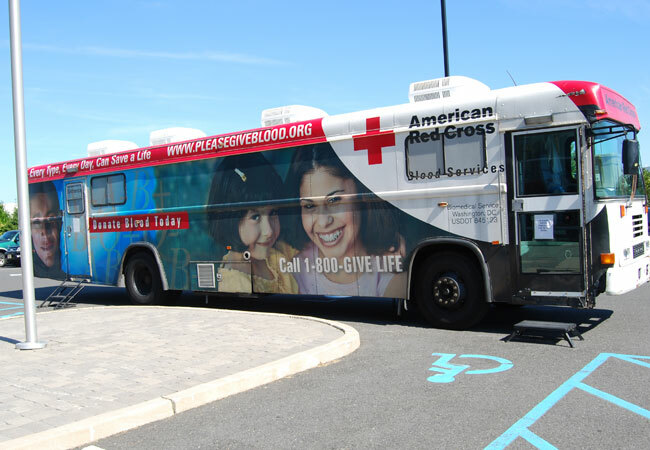 Every six months the America Red Cross donor bus visits Radwell. Our Goal is 40 pints and during our last drive we achieved over 50 pints! 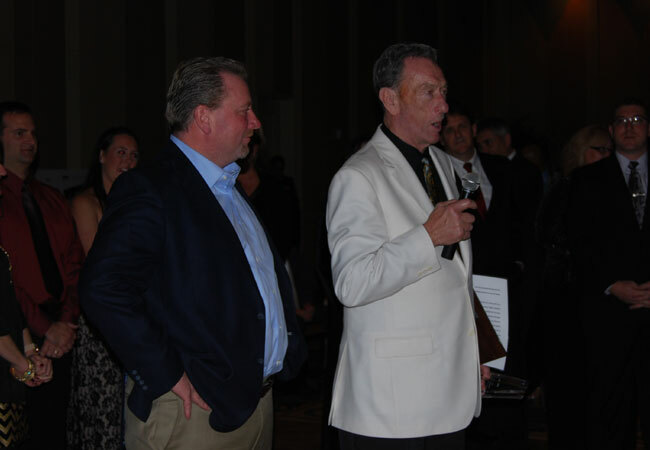 Frank Dwyer was awarded the Jerry Radwell MVP of the Year Award at our 2012 Holiday Party. Congrats Frank! 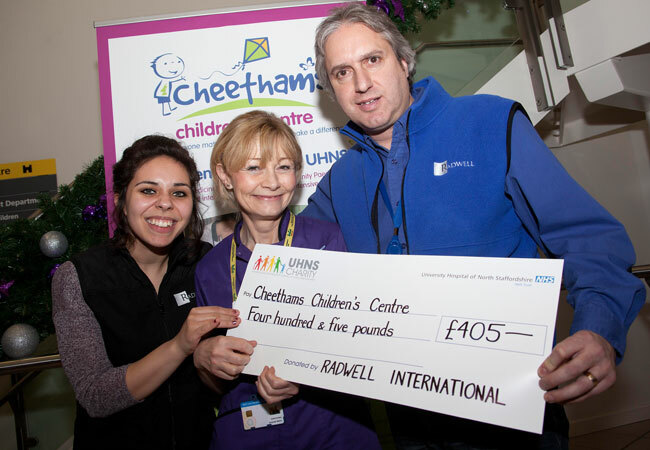 Our UK branch donated over £400 to the Cheethams Children’s Center to help with the Holiday Season. 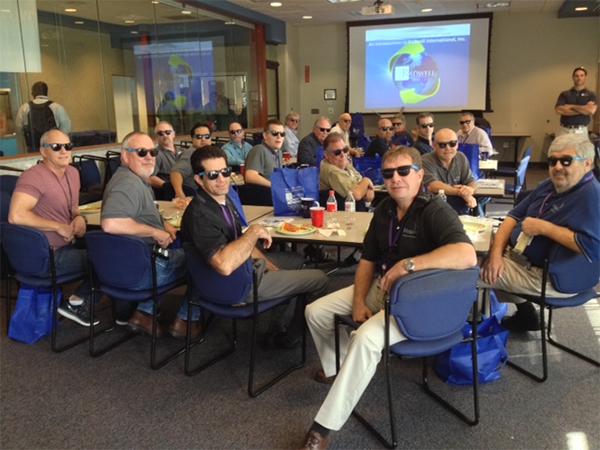 Radwell Team always looks awesome in their company sponsored Rad-Wear Green, Blue, Red, even Purple and Pink. Your choice. 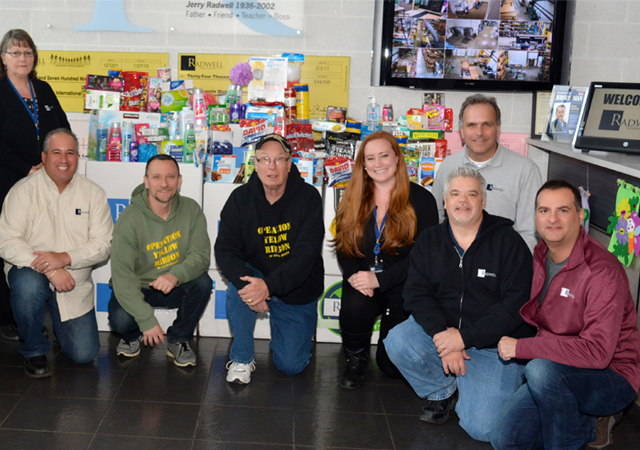 We donated hundreds of boxes to the Hurricane Sandy Relief. 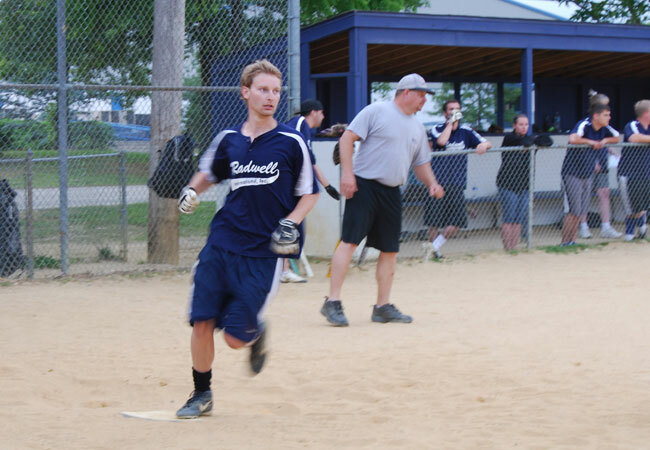 Radwell Family Members participate athletically, Team Radwell Rocks! Our vans got a makeover in late 2012. Need a break, meet the newbies, Radwell Social Five is the time to get up and dance in the aisles. 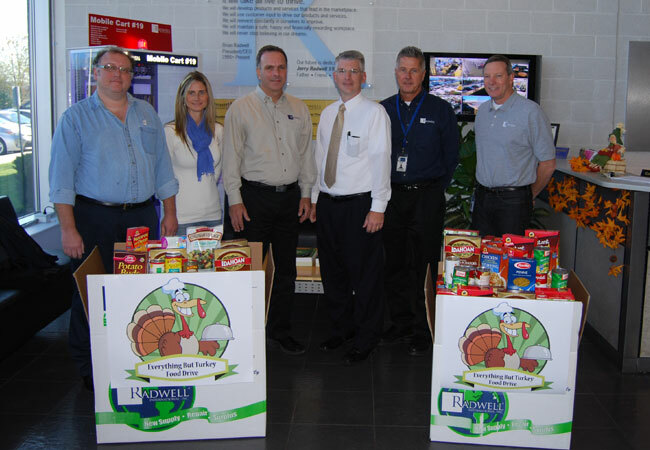 With the 2012 food drive, we were able to help even more families as more people donated food. One great thing about Radwell is building new friendships. 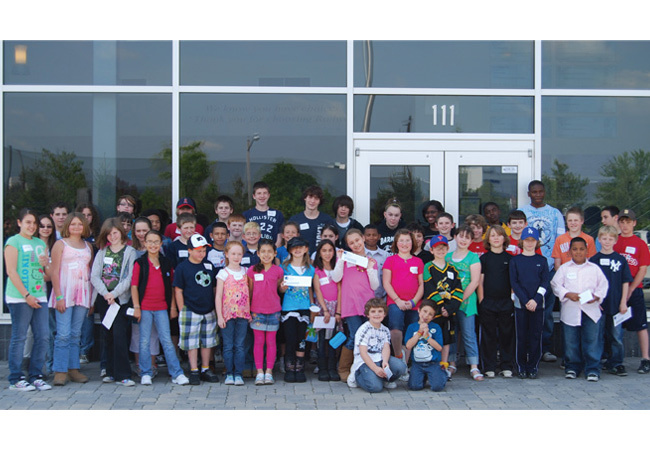 100's of Radwell's children have enjoyed a fun filled day during Radwell's Annual Bring Your Child To Work Day complete with a $25.00 paycheck. 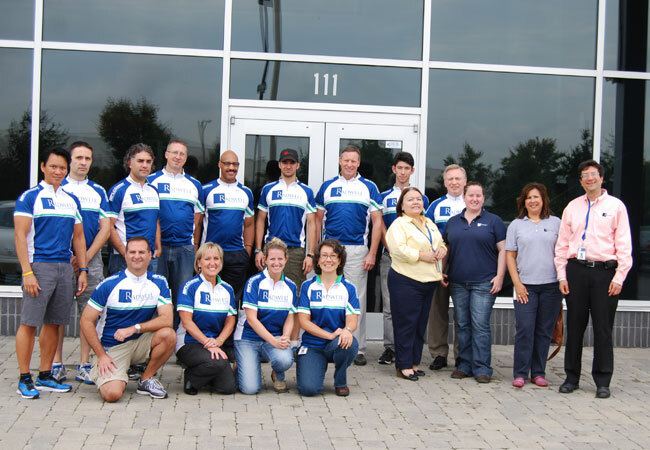 Radwell formed a team for the MS City to Shore Bike Ride. They did great and already getting ready for 2013. 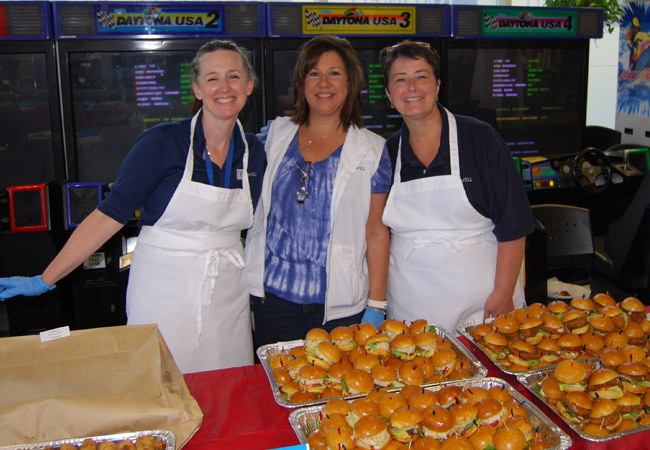 These three awesome ladies served the employees our Surf and Turf goal achievement lunch. 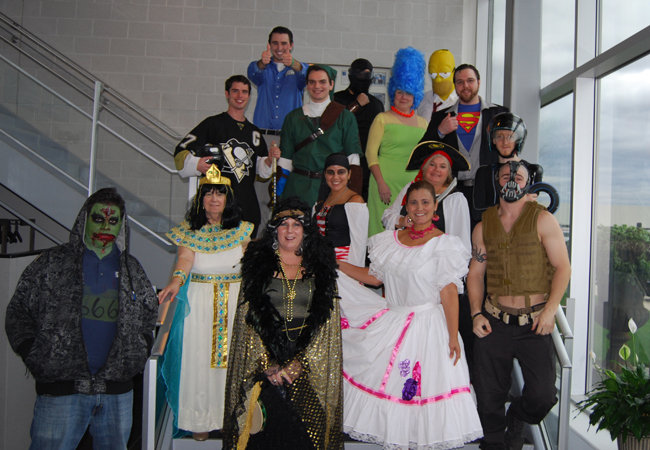 One of many Holiday Spirit Contests with cash prizes; get dressed up and get ready for some fun. Together we raised over $6,000 for breast cancer research. 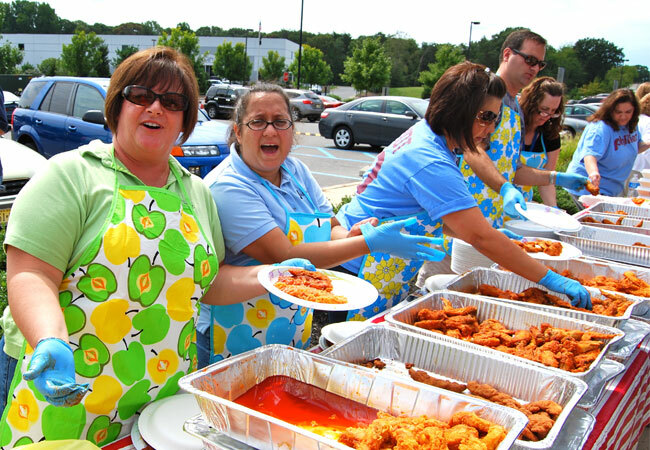 For hitting goal, we had a Buffalo Wing Day during the summer. It’s always a great time. 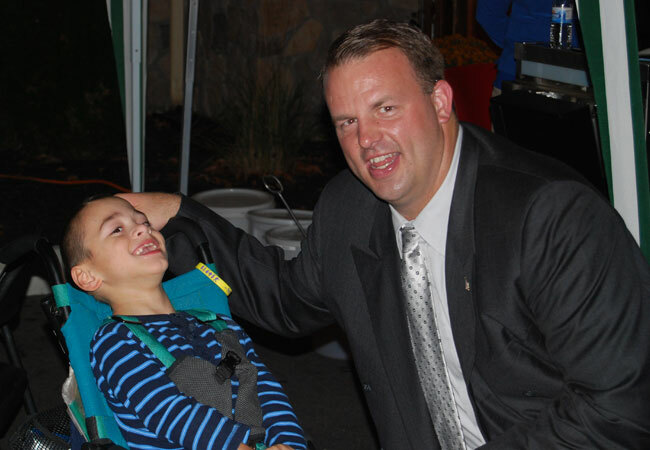 The JDRF South Jersey Chapter is Proud to Announce the 2011 Dream Gala Honoree Brian Radwell of Radwell International, Inc.
Radwell's Big Heart Program rallies everyone together to support the community and the world. Here we donate $50,000 to the American Red Cross for Haiti relief. Toy Drive 2011 was a lot of fun. We donated over 400 toys to local charities. 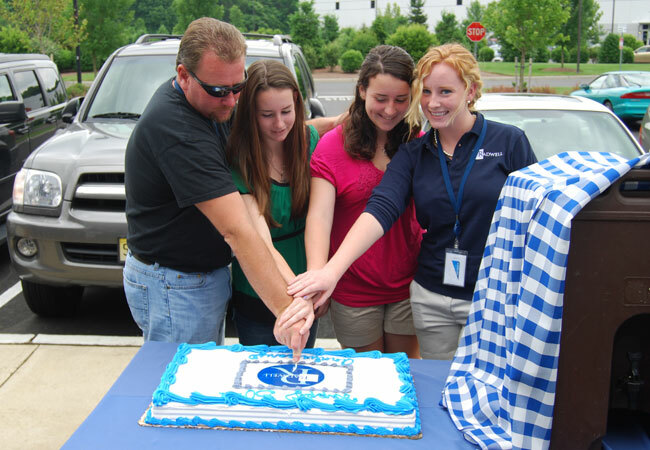 Together we Celebrate Company Milestones (30 years down many more to go). 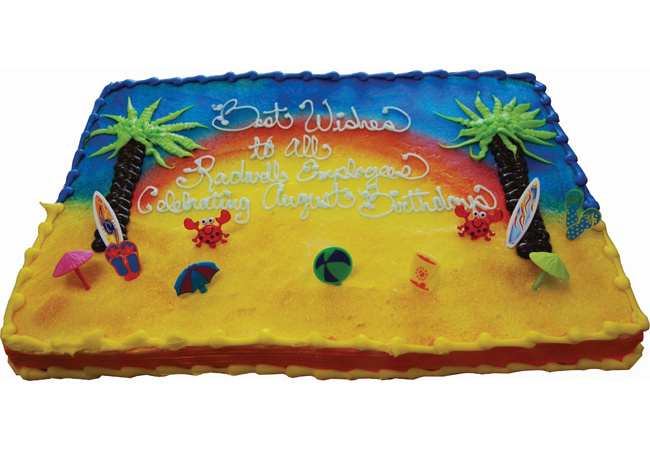 Every month we celebrate that month's birthdays with a giant cake. 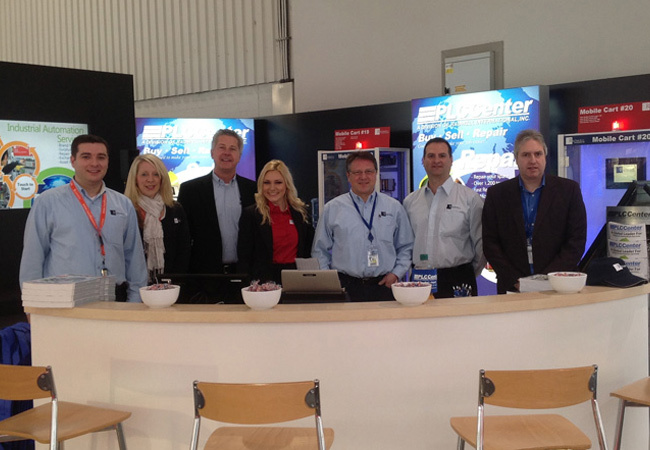 Our team in Hannover, Germany in our new trade show booth. 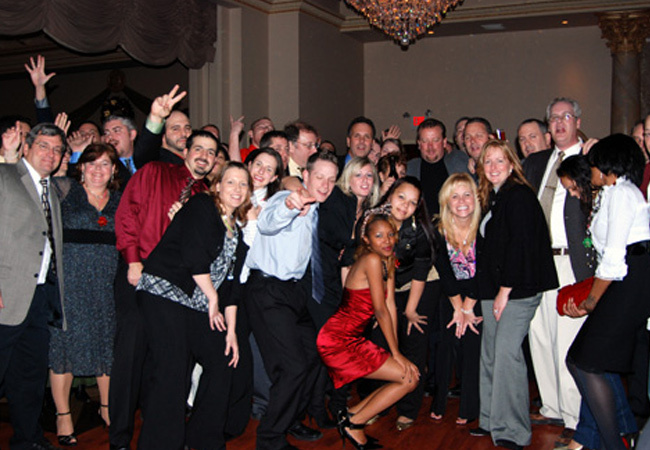 We celebrate at the end of each year with our huge Holiday Party. We go to company sponsored events. 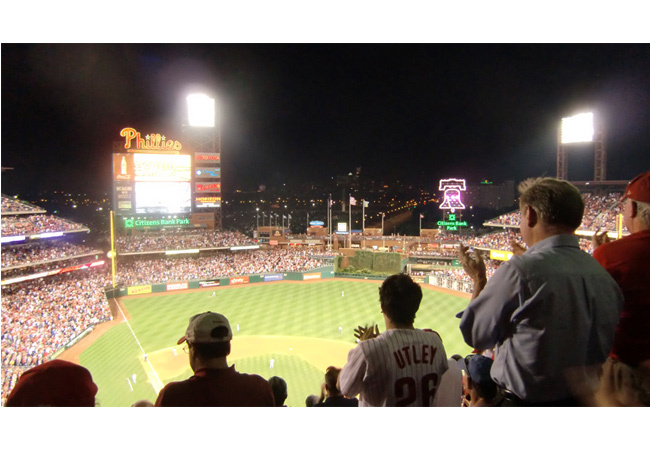 We support numerous recreational sports teams made up of our employees.